The most common emails that I receive are sad stories. Someone with lots of beliefs and issues, emotionally, psychically, or physically abused the person who wrote to me. The writer feels stuck because the abuser won’t take responsibility for their actions. They won’t apologize. Maybe they won’t even admit that they did anything wrong. Consequently, the writer can’t seem to leave the pain of the abuse behind. Often they’re stuck because they’re focusing on the physical event itself instead of the beliefs in their mind before and after the event. Freedom begins with taking responsibility for everything in OUR mind. If we accept that we put beliefs in (even if tricked to do so), then we can take those beliefs out. Abusers are usually fragile personalities that are quick to anger and slow to forgive. Abusers are filled with beliefs. Emotions arise within them (because of whatever they’re thinking), but they don’t recognize the connection between their thoughts and their emotions. They’re sure the cause is outside of them. If you happen to be nearby when they feel emotions, you’re the cause. Prior to any abuse, abusers always say or imply something that causes their potential victim to lose power. The abuser claims the masculine role. If the potential victim believes the abuser, they fall out of their safe True Self into a feminine role within the abuser’s dangerous illusion. For example: “Put your hands up or I’ll shoot” is a statement that says, “I’m in charge here, and you’re feminine to me. You must do whatever I say.” Since most people are trained to drop into the feminine role on command, the abuser usually succeeds. The abuser fails when the potential victim doesn’t drop into the feminine. If the potential victim stays in their True Self, they’re inspired to speak the right words or take the right action to end the abuse. I recently saw a robbery on television. A robber walked up to a cashier with a gun and gave a command. The cashier replied, “I’ll give you what you want, but you must step over here.” The cashier didn’t believe the robber’s command; he retained his power and remained calm. Then the cashier threw a cup of spices in the robber’s eyes. No one was harmed, and the robber left. In the interview, the cashier said he was inspired to speak and act — that’s his True Self in control. Emotions are always a reaction to our OWN beliefs. Other people’s emotions are their reaction to their OWN beliefs (not what we did or said). The robber was emotional. The cashier recognized that the robber’s emotion-wrapped words weren’t true. He stayed in his True Self where no one can rob or harm him. We don’t come into the world armed with a rulebook of beliefs because beliefs are false — unreal. We come in as True Selves. But, we inevitably trigger the beliefs of authority figures early in life because we don’t know their rules or beliefs. They punish, shame, or guilt us; or worst of all, they blame us for their emotions. 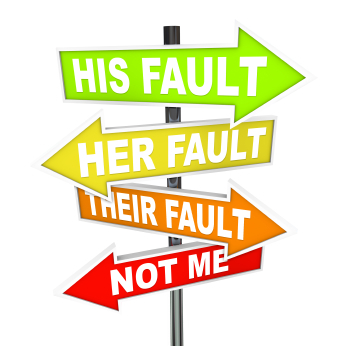 We accept that blame because they’re our authority figures; we’re supposed to respect and trust them. We’re now living in their illusion where their beliefs and rules have power. Many people spend their lives fixing their parent’s illusion. That won’t lead to freedom. Other people think they have to wait patiently until their abusers let go, apologize, or die; but that rarely happens. Look again at our robbery example. The cashier didn’t wait for the robber to change his mind. He didn’t try to transform or psychoanalyze the robber. The cashier simply took responsibility, didn’t accept the command (beliefs) of the robber, and never became feminine to the robber. He stayed in his True Self, where he remained powerful and safe. You go home to your parents for a visit, and your father says, “I don’t want you to move to LA. I’ll worry.” What he’s really saying is that you need to do whatever keeps me from feeling emotions. You recognize that in order for that to happen, you’d have to move into a eight-by-ten cement room with no door. You want to move to LA, but you don’t want your dad to worry. At this point, most of us start trying to convince dad that we’ll be safe, and no matter what we say, he doesn’t hear us. Or we get stern and take over the masculine role and say, “Sorry, I’m grown up now. I’ll do what I want,” which causes a power struggle. What we don’t do is let go first. Dad’s statement doesn’t feel good. Therefore it isn’t the truth. Now he may be a first-class master worrier in the illusion you share with him. But his True Self doesn’t worry. So if you let go, you’re not in his illusion anymore. The conversation must shift. If inspired, you offer a response after letting go that causes him to join you. If not, you wait until he says something else. “Your mother will cry if you aren’t around.” He’s had some training in the black arts of guilt. But you notice what he said doesn’t feel good. You don’t believe it. You stay in your True Self. If you stay clear, something will shift in the conversation. More important, you’ll remain free. Power games occur only because we allow ourselves to be pulled into another person’s illusion. Once we’re in it, it looks real. We can’t be happy in another person’s illusion, and we can’t change their illusion. But we don’t have to. We just have to let it go; and return to our perfect life.